Background and aims The Crohn's Disease Activity Index (CDAI) has been criticised due to heavy weighting on subjective clinical symptoms. C-reactive protein (CRP) and endoscopic lesions are objective measures of inflammation. We investigated the relationships between clinical disease activity, CRP normalisation and mucosal healing in Crohn's disease (CD). Methods The Study of Biologic and Immunomodulator Naive Patients in CD trial compared infliximab to azathioprine and to infliximab plus azathioprine in 508 CD patients. Mucosal healing was defined as the absence of mucosal ulceration at the week 26 ileocolonoscopy in a patient who had evidence of ulceration at the baseline ileocolonoscopy. Results 188 patients who had evaluable ileocolonoscopy with evidence of mucosal ulceration at baseline, CDAI scores and CRP values at baseline and week 26 were analysed. 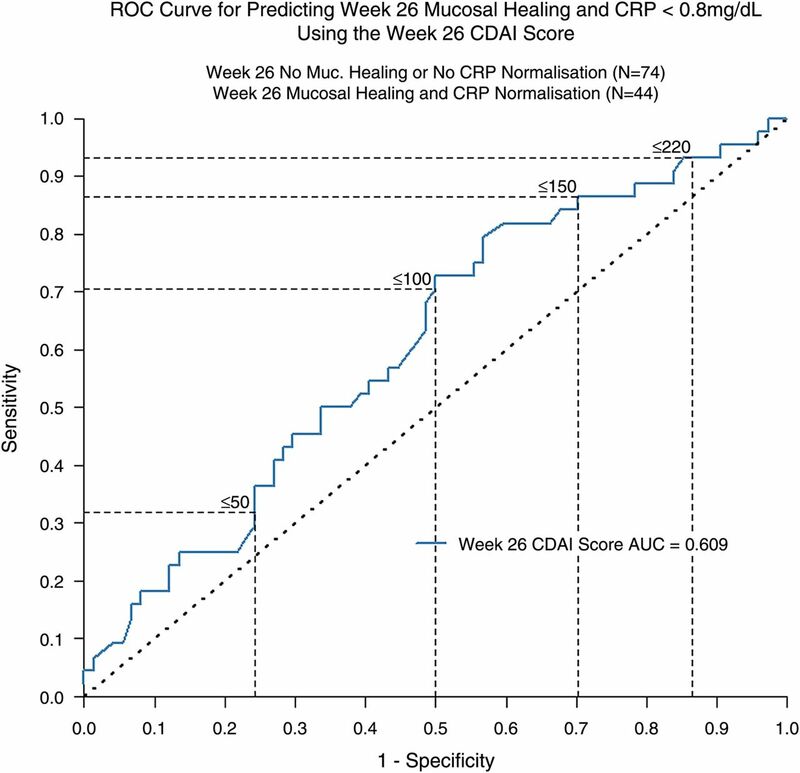 Seventy-two of 136 patients (53%) who had a CDAI<150 at week 26 achieved mucosal healing, and 38 of 90 patients (42%) achieved both CRP normalisation (CRP<0.8 mg/dL) and mucosal healing while in clinical remission. The positive predictive value (PPV) and negative predictive value (NPV) of CDAI to detect mucosal healing using 150 as a cut-off for CDAI were 65% and 53%, respectively. The PPV and NPV of CDAI to detect mucosal healing and CRP normalisation using 150 as a cut-off for CDAI were 79% and 42%, respectively. Conclusions Half the patients under azathioprine and/or infliximab in clinical remission have endoscopic and/or CRP evidence of residual active CD, whereas other patients with endoscopic and CRP normalisation have persistent clinical symptoms. Clinical symptoms as scored by CDAI are not a reliable measure of the underlying inflammation. The Crohn's Disease Activity Index (CDAI) is heavily weighting on subjective clinical symptoms. Crohn's disease (CD) patients in clinical remission may not achieve C-reactive protein (CRP) normalisation and/or mucosal healing, as previously demonstrated for steroids. The accuracy of CDAI to predict CRP normalisation and/or mucosal healing is unknown in CD. Half the patients with CD in clinical remission have endoscopic and/or CRP evidence of residual active CD. The accuracy of the CDAI to detect endoscopic healing is low in patients with CD. Clinical symptoms as scored by CDAI are not a reliable measure of the underlying inflammation in CD. Our findings indicate that if achieving mucosal healing is a treatment goal, then decisions regarding medical therapy cannot be guided solely by clinical symptoms. Several clinical indices have been proposed to assess disease activity in Crohn's disease (CD), including the CD Activity Index (CDAI) and the Harvey-Bradshaw Index (HBI).1–3 The CDAI has evolved as the gold standard for clinical trials.4 Although the CDAI may be adequate for measuring disease activity in some circumstances, it has some important limitations including the fact that approximately 40% of the index is derived from three subjective criteria (diarrhoea, abdominal pain and sense of well-being) which account for 80% of the responsiveness to change,2 while it does not take into account the more objective measures of inflammation (such as C-reactive protein (CRP) and endoscopic lesions) in a disease which is by definition inflammatory in nature. In 1991, Andre et al5 compared for the first time the ability of 11 laboratory parameters, including CRP, to reflect the degree of activity of CD and found that CRP correlated significantly with clinical status; this observation was later confirmed in a prospective CD study by Cellier et al.6 By contrast, in 2000, a study of CD patients under treatment with prednisolone showed no correlation between clinical symptoms as measured by the CDAI and either biomarker disease activity as measured by CRP or endoscopic disease activity as measured by the CD Endoscopic Index of Severity.7 In a prospective study including 121 CD patients, the same study group GETAID later described a weak although significant correlation between CDAI and CDEIS scores with a 0.26 (untransformed) correlation value (p<0.001).6 In 2006, an endoscopic substudy from the ACCENT 1 trial of infliximab as maintenance therapy for CD demonstrated that 18% of patients with moderate to severe CD as measured by the CDAI had no endoscopic evidence of active CD.8 Taken together, these data suggest the need to further assess the relationships between clinical symptoms of CD, as captured in clinical scores, and objective signs of inflammation, such as CRP and ileocolonoscopy findings, in order to better determine how CD activity should be measured. We therefore investigated the relationships between clinical disease activity, normalisation of CRP, and mucosal healing (MH) in CD using a large population of patients who were included in the Study of Biologic and Immunomodulator Naive Patients in CD (SONIC) trial and who prospectively had systematic evaluation of CD activity as measured by the CDAI, CRP and ileocolonoscopy. The primary efficacy endpoint was the proportion of patients in clinical remission (CDAI<150) who had discontinued oral systemic corticosteroids (eg, prednisone) at week 26 for at least 6 weeks and had not been taking budesonide at a dose higher than 6 mg/day for at least 6 weeks. Patients received study medication through week 30 and could continue in a blinded study extension through week 50. CDAI was measured at weeks 0 (baseline) 2, 6, 10, 18, 26, 34, 42 and 50. Ileocolonoscopy was performed, and CRP was measured at baseline and week 26.9 MH was a secondary endpoint and was defined as the absence of mucosal ulceration at ileocolonoscopy at week 26 in a patient who had evidence of ulceration present at the baseline ileocolonoscopy, as assessed by the study's blinded central reader.9 The current retrospective analysis was not prespecified per SONIC protocol. Our objective was to evaluate the positive (PPV) and negative predictive values (NPV) of CDAI to detect endoscopic healing (no ulcerations) and/or CRP normalisation (CRP<0.8 mg/dL, equivalent to 8 mg/L). PPV and NPV were also expressed as positive and negative predictive value factor (PPVF and NPVF). For that purpose, we first evaluated the rates of CRP normalisation (CRP<0.8 mg/dL) and MH among the patients who had evidence of mucosal ulceration at baseline and had evaluable ileocolonoscopy and available CDAI and CRP values at week 26. We then used endoscopic activity and biological activity as a reference to calculate the PPV and NPV of CDAI to detect endoscopic healing and/or biomarker remission using different cut-offs for CDAI (50, 100, 150 and 220). Sensitivity, specificity and overall accuracy, namely, the weighted average of sensitivity and specificity, were also calculated. Overall accuracy is the probability that an individual will be correctly classified by a test; that is, the sum of the true positives plus true negatives divided by the total number of individuals tested. Finally, the area under the curve (AUC) was calculated using CDAI as a continuous variable. Regarding comparison of baseline characteristics between patients included and excluded from this analysis, p values for all categorical variables are based on a two-sided χ2 test. p Values for continuous variables are based on analysis of variance on the van der Waerden normal scores. Correlations between CDAI scores and CRP levels were analysed using the Pearson correlation coefficient. Statistical analyses were performed using MedCalc software, V.11.6.1.0 (MedCalc Software, Belgium). A total of 188 patients who had evidence of mucosal ulcerations at baseline and had evaluable ileocolonoscopy and available CDAI and CRP values at week 26 were included in the analysis (table 1). A total of 118 patients had CRP >0.8 mg/dL and evidence of mucosal ulceration at baseline and had evaluable ileocolonoscopy available CDAI and CRP values at week 26. Baseline characteristics of the 188 patients included in this posthoc analysis were largely comparable with those of the 320 patients who were not included, as well as to the whole SONIC patient population (table 1). The reasons for exclusion of 320 SONIC patients from this analysis are summarised in table 2. It is noteworthy, however, that less included, compared with nonincluded patients, had only ileal disease (26.5% vs 40.3%), and baseline CRP was elevated in more included than nonincluded patients (62.8% vs 55.3%). The proportion of patients with previous bowel resection was comparable between the included and the nonincluded patient groups (21.3% and 20.3%, respectively) (table 1). Of the 188 patients with mucosal ulcerations at baseline, 90 (48%) achieved MH (table 3). More patients with CD duration ≤2 years showed MH at week 26 compared with patients with >2 years disease duration (p=0.031) (table 3). Furthermore, a greater proportion of patients without previous bowel surgery were in clinical remission, had MH, and were in remission with MH compared with those with previous bowel resection(s) (table 4). Of these 188 patients, 136 (72%) were in clinical remission at week 26. A total of 72 out of 136 patients (53%) in clinical remission achieved MH at week 26 (table 5). More patients with CD duration ≤ 2 years showed MH while being in clinical remission at week 26 compared with patients with >2 years disease duration (p=0.037) (table 3). Among the 52 patients (27.7%) who had active disease (CDAI≥150) at week 26, 18 patients (34.6%) had MH (table 5). The NPVF and PPVF of CDAI to detect MH (no ulcerations) using 150 as a cut-off for CDAI were 1.73 and 1.22, respectively; sensitivity and specificity were 80% and 34.7%, respectively. The overall accuracy was 56.4% (table 6). Of the 188 patients, only 27 (14%) had moderate to severe disease (CDAI >220) at week 26 (table 5). A total of 8 out of those 27 patients (30%) achieved MH at week 26. Among the 161 patients (86%) who had CDAI <220 at week 26, 82 patients (51%) had MH (table 5). The NPVF and PPVF of CDAI to detect MH (no ulcerations) using 220 as a cut-off for CDAI were 2.18 and 1.13 respectively; sensitivity and specificity were 91.1% and 19.4%, respectively. The overall accuracy was 53.7% (table 6). When considering 50 and 100 as cut-offs for CDAI, a decrease in NPVF was observed without any significant impact on PPVF (table 6). The AUC for detecting MH was 0.568 (figure 1). 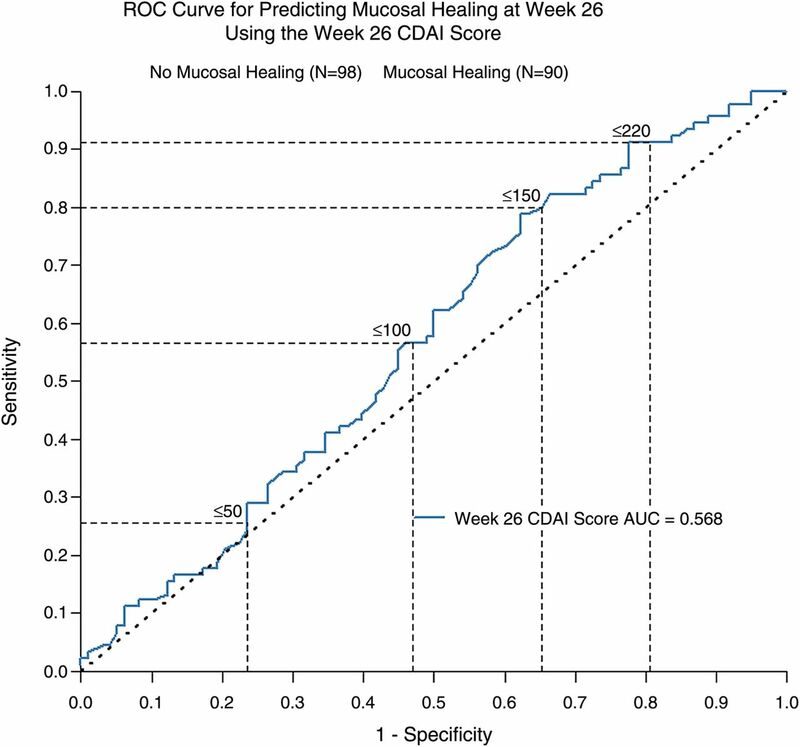 Area under the curve (AUC) using Crohn's Disease Activity Index (CDAI) as a continuous variable for detecting mucosal healing (receiver operating characteristic (ROC) analysis). We also explored the disconnect between clinical symptoms and MH rates according to each treatment arm (azathioprine alone, combination therapy, and infliximab alone) among those with a CDAI 100 points decrease from baseline (see online supplementary table 1) and among patients in clinical remission at week 26 (see online supplementary table 2). Of the 118 patients with CRP >0.8 mg/dL at baseline, 69 (58.5%) had CRP normalisation (table 3). Of the 118 patients, 90 (76%) were in clinical remission at week 26. A total of 59 out of 90 patients (66%) were in clinical remission and had CRP normalisation at week 26; the proportion of CD patients with CRP normalisation while in clinical remission was not different for patients with ≤ or >2 years disease duration (p=0.267) (table 3). Among the 28 patients who had active disease (CDAI ≥150) at week 26, 10 patients (55.5%) had CRP normalisation (table 7). The NPVF and PPVF of CDAI to detect CRP normalisation were 2.53 and 1.35, respectively; sensitivity and specificity were 85.5% and 36.7%, respectively. The overall accuracy was 65.2% (table 8). Using 220 as a cut-off for CDAI was associated with a decrease in both NPVF and PPVF (table 8). When considering 50 and 100 as cut-offs for CDAI, a decrease in NPVF together with an increase in PPVF were observed (table 8). The AUC for detecting CRP normalisation was 0.652 (figure 2). Area under the curve (AUC) using Crohn's Disease Activity Index (CDAI) as a continuous variable for detecting C-reactive protein (CRP) normalisation (receiver operating characteristic (ROC) analysis). Baseline CDAI and CRP levels in patients with elevated CRP were not correlated (Pearson correlation coefficient of 0.123; p=0.182; n=118), whereas, both markers were correlated at week 26 (Pearson correlation coefficient of 0.395; p<0.001; n=118). Changes in CDAI and CRP from baseline at week 26 were also correlated (Pearson correlation coefficient of 0.329; p=0.0003; n=118). Of the 118 patients with CRP >0.8 mg/dL and evidence of mucosal ulceration at baseline, 44 (37.3%) had CRP normalisation and MH (tables 3 and 4). Of the 118 patients, 90 (76%) were in clinical remission at week 26. A total of 38 out of 90 patients (42%) had CRP normalisation and MH, while in clinical remission at week 26; the proportion of CD patients with CRP normalisation and MH while in clinical remission was not different for patients with ≤ or >2 years disease duration (p=0.200) (table 3). Among the 28 patients who had active disease (CDAI ≥150) at week 26, only 6 patients (21.4%) had CRP normalisation and MH (see online supplementary table 3). The NPVF and PPVF of CDAI to detect CRP normalisation and MH were 2.18 and 1.23, respectively; sensitivity and specificity were 86.4% and 29.7%, respectively. The overall accuracy was 50.8% (see online supplementary table 4). Using 220 as a cut-off for CDAI was associated with a decrease in both NPVF and PPVF (see online supplementary table 4). A decrease in NPVF was observed when considering 50 and 100 as cut-offs for CDAI, together with an increase in PPVF when using 100 as a cut-off for CDAI (see online supplementary table 4). The AUC for detecting CRP normalisation and MH was 0.609 (figure 3). Area under the curve (AUC) using Crohn's Disease Activity Index (CDAI) as a continuous variable for detecting mucosal healing and C-reactive protein (CRP) normalisation (receiver operating characteristic (ROC) analysis). Of the 118 patients with CRP >0.8 mg/dL and evidence of mucosal ulceration at baseline, 81 (69%) had CRP normalisation and/or MH (see online supplementary table 3). Of the 118 patients, 90 (76%) were in clinical remission at week 26. A total of 67 out of 90 patients (74%) had CRP normalisation and/or MH at week 26 while in clinical remission (tables 3 and 4). Among the 28 patients who had active disease (CDAI ≥150) at week 26, 14 patients (50%) had CRP normalisation and/or MH (see online supplementary table 5). The NPVF and PPVF of CDAI 150 to detect CRP normalisation and/or MH were 2.18 and 1.23, respectively; sensitivity and specificity were 82.7% and 37.8%, respectively. The overall accuracy was 68.6% (see online supplementary table 6). Using 220 as a cut-off for CDAI was associated with a decrease in both NPVF and PPVF (see online supplementary table 6). A decrease in NPVF was observed when considering 50 and 100 as cut-offs for CDAI, together with an increase in PPVF when using 100 as a cut-off for CDAI and a decrease in PPVF when using 50 as a cut-off for CDAI (see online supplementary table 6). The AUC for detecting CRP normalisation and/or MH was 0.606 (see web figure 1). An early pivotal prospective study of 121 patients with CD reported on correlations of 11 biological markers with clinical disease activity as measured by CDAI and endoscopic severity as measured by CDEIS.6 Only weak correlations were found, and the authors concluded that Crohn's clinical disease activity seemed to be virtually independent of the severity of the mucosal lesions and biological activity.6 Clinical indices, such as the CDAI and HBI are still used to evaluate efficacy of various therapeutic agents in CD clinical trials. While clinical symptoms, including diarrhoea and abdominal pain, are frequently used to measure disease activity in patients with CD, they are limited by their subjective and non-specific nature. Our study adds important and new quantification to the disconnect between CD clinical symptoms as measured by CDAI and the endoscopic mucosal appearance and CRP levels by using a large prospective, well-defined subpopulation of the SONIC trial. Mucosal lesions and biomarkers, such as CRP, are objective markers of inflammation. They are now increasingly used as entry criteria in clinical trials in patients with CD to reduce the magnitude of the placebo effect by increasing the likelihood that the patients’ symptoms are truly related to inflammation. In the SONIC study, week 26 corticosteroid-free remission rates were higher in patients with endoscopic lesions at baseline and/or baseline elevated CRP, showing that targeting the objective signs of inflammation rather than symptoms is beneficial in CD patients treated with infliximab.9 Current therapeutic strategies aiming at inducing and maintaining clinical remission have failed to modify the course of CD when considering avoidance of surgery as a surrogate treatment endpoint.10 Accumulating evidence indicates that achieving MH may change the natural course of the disease by decreasing the need for surgery and reducing hospitalisation rates in CD.11 MH is now recognised as a potential new therapeutic goal in CD, both in clinical trials12 and to a lesser degree in clinical practice. The concept of ‘deep remission’, including clinical, biomarker and endoscopic remission, is also emerging as a new treatment goal in CD, but requires much more investigation. In this context, the ability of clinical disease activity indices to predict biomarker and endoscopic healing in patients with CD is receiving increasing attention. In these posthoc analyses from the SONIC trial, approximately half of all CD patients in clinical remission had endoscopic and/or biomarker evidence of residual active CD, and one-fifth of patients with endoscopic and biomarker remission had persistent clinical symptoms. We were able to demonstrate that the accuracy of the CDAI to detect endoscopic healing was relatively low in patients with CD, irrespective of the CDAI cut-off level. Our results show that the proportion of patients with CD who are correctly identified as having MH is low using the CDAI as a marker of disease activity. Hence, our findings indicate that if achieving MH is a treatment goal, then decisions regarding medical therapy cannot be guided solely by clinical symptoms. The sensitivity of CDAI to detect MH was reasonably good, with values of 80% and 91.1% using the 150 or 220 cut-offs for CDAI, respectively. However, the specificity was low (34.7% and 19.4%, respectively). Using MH and/or biomarker remission to calculate the performance of CDAI only slightly improved sensitivity. More interestingly, the use of a CDAI score of 50 or 100 dramatically increased the specificity of the CDAI, but at the cost of sensitivity to detect endoscopic and/or biomarker remission. In all analyses, the overall accuracy was modest, thus confirming that CDAI is not an accurate marker to detect persistence of endoscopic and/or biomarker disease activity. The main strength of our study is the use of a well-defined population included in a large randomised, controlled trial using prospective standardised evaluation of clinical, biomarker and endoscopic disease activity. This posthoc analysis was not prespecified, and the number of included patients is only a fraction of the total SONIC patient population (188/508). We compared the characteristics of included and non-included patients; more included patients had baseline-elevated CRP and some differences regarding disease localisation. Systemic corticosteroid use, however, was not different. Although the patients included in SONIC had a short median disease duration of 2.2 years, we investigated the effect of disease duration on clinical, endoscopic and biological outcome measures. Clinical remission rate and rate of CRP normalisation were not different between patients with ≤ or >2 years disease duration; the rate of MH, however, was different between these subgroups (p=0.031), and the proportion of patients with MH while in remission was also different (p=0.037), thus indicating that MH is easier to achieve in early CD. A possible limitation of our study is the lack of cross-sectional imaging studies using CT or MRI enterography which can reveal inflammatory lesions in intestinal segments not accessible by ileocolonoscopy, or in which the lesions are primarily intramural. Indeed, ileocolonoscopy examination can miss CD of the terminal ileum, because the disease can skip the distal ileum, or is confined to the intramural portion of the bowel wall and the mesentery.15 Also, the possible presence and change of upper gastrointestinal CD lesions was not assessed in the SONIC trial. 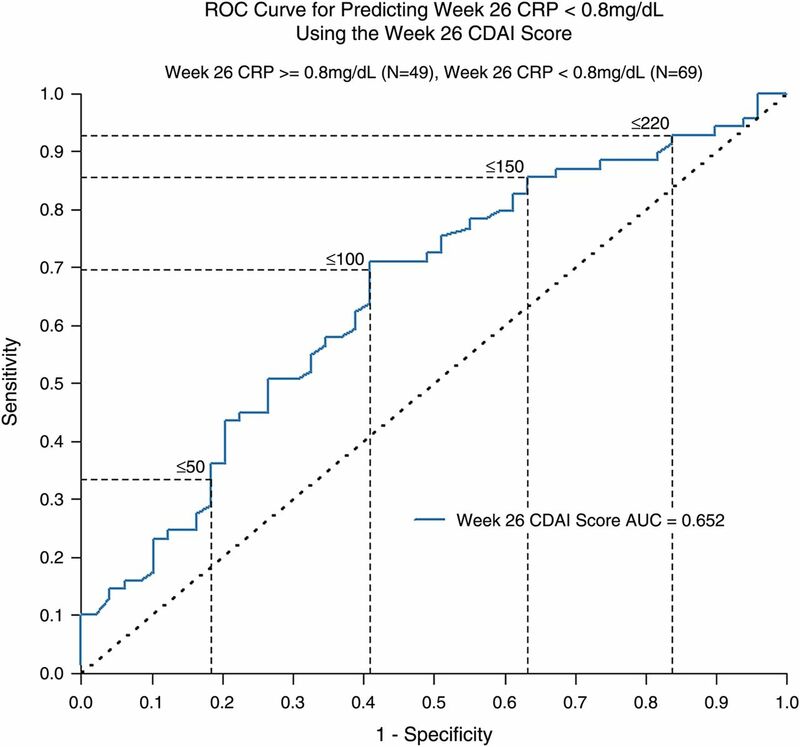 Of note, we found that CDAI scores and CRP levels were correlated at week 26. In a posthoc analysis of the SONIC trial, Ferrante et al16 found a good correlation between ΔCDEIS and ΔSES-CD (Pearson's r=0.89, p<0.0001), but a modest correlation between ΔCDEIS and ΔCDAI (r=0.22, p=0.0045), ΔCDEIS and ΔCRP (r=0.27, p=0.0004), ΔSES-CD and ΔCDAI (r=0.27, p=0.0003), ΔSES-CD and ΔCRP (r=0.28, p=0.0002). In conclusion, clinical symptoms of CD, as measured by the CDAI, do not accurately predict endoscopic and/or biomarker remission among patients under azathioprine and/or infliximab. Objective outcome measures of CD activity, in addition to evaluation of clinical symptoms, would be needed in disease modification trials aiming at changing the natural history of CD. Prospective studies are needed to identify the best target(s) of CD treatment.
. A review of activity indices and efficacy endpoints for clinical trials of medical therapy in adults with Crohn's disease. Gastroenterology 2002;122:512–30.
. A simple index of Crohn's-disease activity. Lancet 1980;1:514.
. Short CDAI: development and validation of a shortened and simplified Crohn's disease activity index. Inflamm Bowel Dis 1002;17:105–11.
. Assessment of appropriate laboratory measurements to supplement the Crohn's disease activity index. Gut 1981;22:571–4.
. Correlations between clinical activity, endoscopic severity, and biological parameters in colonic or ileocolonic Crohn's disease. A prospective multicentre study of 121 cases. GUT 1994;35:231–35.
. Clinical, biological, and endoscopic picture of attacks of Crohn's disease. Evolution on prednisolone. Groupe d'Etude Therapeutique des Affections Inflammatoires Digestives. Gastroenterology 1990;98:811–18.
. Scheduled maintenance treatment with infliximab is superior to episodic treatment for the healing of mucosal ulceration associated with Crohn's disease. Gastrointest Endosc 2006;63:433–42.
. Infliximab, azathioprine, or combination therapy for Crohn's disease. N Engl J Med 1383;362:1383–95.
. Surgery for adult Crohn's disease: what is the actual risk? Gut 2011;60:1178–81.
. Results from the 2nd Scientific Workshop of the ECCO. I: impact of mucosal healing on the course of inflammatory bowel disease. J Crohns Colitis 2011;5:477–83.
. Adalimumab induces and maintains mucosal healing in patients with Crohn's disease: data from the EXTEND trial. Gastroenterology 2012;142:1102–11.e2.
. Correlation of C-reactive protein with clinical, endoscopic, histologic, and radiographic activity in inflammatory bowel disease. Inflamm Bowel Dis 2005;11:707–12.
. Majority of patients with inflammatory bowel disease in clinical remission have mucosal inflammation. Inflamm Bowel Dis 1002;2011:21925.
,et al. Endoscopic skipping of the distal terminal ileum in crohn's disease can lead to negative results from ileocolonoscopy. Clin Gastroenterol Hepatol 2012;10:1253–9.
. Evolution of endoscopic activity scores in patients with crohn's disease under azathioprine and/or infliximab: a post-hoc analysis of the sonic data. Gastroenterology 2011;140(Suppl 1):S422. Contributors LPB, conception and design of the study, assembly, analysis and interpretation of data, drafting of the manuscript; WR, JFC, GJM, AK, FJC and PR, interpretation of data and revision of the manuscript; KLT, collection, assembly and analysis of data; WJS, design of the study, interpretation of data and drafting of the manuscript. All authors approved the final version of the manuscript. Competing interests LP-B has served as consultant and/or has received lecture fees from Merck, Abbott, Janssen, Genentech, Mitsubishi, Ferring, Norgine, Tillots, Vifor, Shire, Therakos, Pharmacosmos, Pilège, BMS, UCB-pharma, Hospira, Takeda; WR: Consulting and lectures fees from MSD. JM has received Research Grants from AstraZeneca, consulting and/or advisory board fees from Centocor Ortho Biotech, Schering-Plough, MSD, Abbott Laboratories, UCB Pharma, Schering-Plough Hellas, Abbott Hellas, and lecture fees from Ferring International, Abbott Immunology, FALK Foundation, Angelini, Schering-Plough Hellas, and Abbott Hellas, and received advisory boards fees from Pharmacosmos; AK has been a paid speaker and paid advisory board member to Janssen; J-FC and PR and WJS have served as study investigators and consultants for Abbott Laboratories. J-FC has served on advisory boards and as a speaker for Abbott. WJS has received grant and/or research support and lecture fees from Abbott. Additionally, J-FC has received consulting fees from ActoGeniX, Albireo Pharma, AstraZeneca, Bayer AG, Biogen Idec, Boehringer Ingelheim GmbH, Bristol-Myers Squibb, Cellerix, Centocor, Chemocentryx, Cosmo Technologies, Danone Research, Elan Pharmaceuticals, Genentech, Giuliani SpA, Given Imaging, Glaxo Smith Kline, Hutchison MediPharma, Millennium Research Group, Ocera Therapeutics, Inc, Pfizer, Shire Pharmaceuticals, Schering-Plough, Synta Pharmaceuticals Corp, Teva, Therakos, UCB Pharma, and Wyeth; has served on advisory committees for Centocor, Danone, Elan, Millennium Research Group, Schering-Plough, and UCB Pharma; has received speaking fees from Centocor, Elan Pharmaceuticals, Given Imaging, Otsuka America Pharmaceutical, Schering-Plough, Shire Pharmaceuticals, and UCB Pharma; and received grant support from Astra-Zeneca, Ferring, Schering-Plough, and UCB Pharma. PR has received consulting fees from ActoGeniX, Bristol-Myers Squibb, Centocor, Genentech, Italfarmako, Millennium, NovImmune, Schering-Plough, and UCB Pharma; and has received research support from Centocor, Schering-Plough, and UCB Pharma. WJS reports having received consulting fees from ActoGeniX NV, AGI Therapeutics, Inc, Alba Therapeutics Corporation, Albireo, Alfa Wasserman, Amgen, AM-Pharma BV, Anaphore, Astellas Pharma, Athersys, Inc, Atlantic Healthcare Limited, Axcan Pharma (now Aptalis), BioBalance Corporation, Boehringer-Ingelheim Inc, Bristol Meyers Squibb, Celgene, Celek Pharmaceuticals, Cellerix SL, Cerimon Pharmaceuticals, ChemoCentryx, CoMentis, Cosmo Technologies, Coronado Biosciences, Cytokine Pharmasciences, Eagle Pharmaceuticals, Eisai Medical Research Inc, Elan Pharmaceuticals, EnGene, Inc, Eli Lilly, Enteromedics, Exagen Diagnostics, Inc, Ferring Pharmaceuticals, Flexion Therapeutics, Inc, Funxional Therapeutics Limited, Genzyme Corporation, Genentech (now Roche), Gilead Sciences, Given Imaging, Glaxo Smith Kline, Human Genome Sciences, Ironwood Pharmaceuticals (previously Microbia Inc), Janssen (previously Centocor), KaloBios Pharmaceuticals, Inc, Lexicon Pharmaceuticals, Lycera Corporation, Meda Pharmaceuticals (previously Alaven Pharmaceuticals), Merck Research Laboratories, MerckSerono, Millennium Pharmaceuticals (subsequently merged with Takeda), Nisshin Kyorin Pharmaceuticals Co, Ltd, Novo Nordisk A/S, NPS Pharmaceuticals, Optimer Pharmaceuticals, Orexigen Therapeutics, Inc, PDL Biopharma, Pfizer, Procter and Gamble, Prometheus Laboratories, ProtAb Limited, Purgenesis Technologies, Inc, Receptos, Relypsa, Inc, Salient Pharmaceuticals, Salix Pharmaceuticals, Inc, Santarus, Schering Plough Corporation (acquired by Merck), Shire Pharmaceuticals, Sigmoid Pharma Limited, Sirtris Pharmaceuticals, Inc (a GSK company), SLA Pharma (UK) Limited, Targacept, Teva Pharmaceuticals, Therakos, Tillotts Pharma AG (acquired by Zeria Pharmaceutical Co, Ltd), TxCell SA, UCB Pharma, Viamet Pharmaceuticals, Vascular Biogenics Limited (VBL), Warner Chilcott UK Limited, Wyeth (now Pfizer); has received lecture fees from Bristol Meyers Squibb, and Janssen (previously Centocor); and has received research support from Bristol Meyers Squibb, Genentech, Glaxo Smith Kline, Janssen (previously Centocor), Millennium Pharmaceuticals (now Takeda), Novartis, Pfizer, Procter and Gamble Pharmaceuticals, Shire Pharmaceuticals, and UCB Pharma; FJC and KLT are employees of Janssen Biologics BV, The Netherlands. FJC receives salary and owns stock of Johnson and Johnson; RD is a former employee of Centocor. Ethics approval ClinicalTrials.gov number, NCT00094458. Data sharing statement The authors agree to share the data.